Now Booking for the Season!! Recommended minimum age: 7 years, depending on water conditions. Ideal for beginning and intermediate paddlers. Great for groups and families! Recommended minimum age: 12 years, depending on water conditions. Full River trips with lunch meet at 9:00 am every day. Ideal for the intermediate and expert rafter. ★★ There are no charge for wetsuits - All equipment and the best river shuttles in town are included at no extra charge! We’ll take families down on the class 3’s or 1 person can book a trip. We do take walk-ins too! We can accommodate any size group from a party of 5 to a party of 90. Class 3 Lower Half - Experience the thrilling rapids at Slicky, Lost Bridge, Tuber's Religion, Devil's Eyeball, and the Golf Course. Enjoy relaxed scenic rafting along natural stretches of the Kaweah, then it's time to dig in your paddles for the next sets of rapids. You can take this Class 3 ride and still have time to visit Sequoia National Park or some of our local shops in Three Rivers. Class IV & V Upper Three-quarter - Our class 4 & 5 trips put you through the Upper Kaweah's Gateway Rapids, The Chutes, Osterizer, Willows, Bumper, Powerhouse, and Cyanotic. 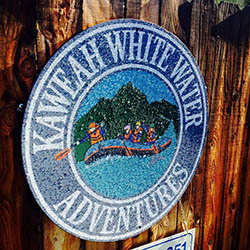 Experience the thrills of plunging over seven-foot waterfalls and maneuvering through the boat-launching Chair. The three-quarter day trip continues on through Upper and Lower Slicky before stopping at Anne Lang's Emporium (where the full day trip has lunch). 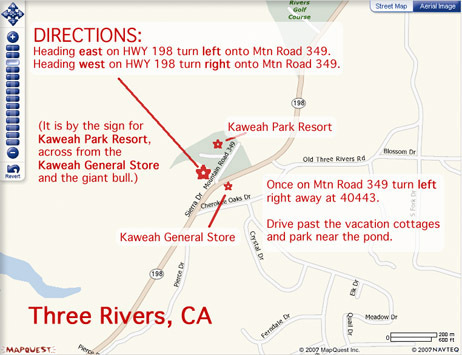 Full River Trips with Lunch - continues after lunch with more relaxing rapids such as Tuber's Religion, Devil's Eyeball, and the Golf Course, before passing by the Kaweah Park Resort. We have a 20 minute safety orientation talk before we in. Click on the map at the bottom of this page for detailed directions from your location!